This recipe I'm experimenting with uses a large Dutch oven (Staub, La Creuset, Pyrex, etc.) to bake a rustic-style bread. It eliminates the need for a pizza stone, which is kind of an expensive, fragile item that I wouldn't normally have a need for. The covered pot acts as a steamer for the earlier part of the baking to allow moisture to stay in the dough. Later with the lid off, the bread finishes browning and generates a nice toasty crust. 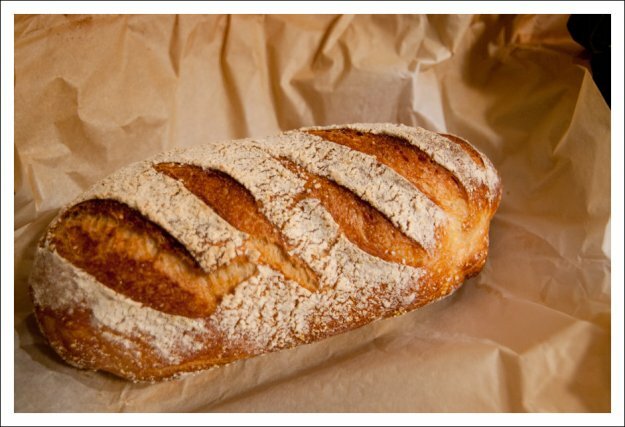 It's really hard to find great bread in LA. Maybe I'm spoiled after coming back from Europe. Or maybe I'm too lazy to trek up to Bay Cities Deli in Santa Monica every time for a loaf (gas is expensive, haven't you heard?). So it was time to take matters into my own hands. I'd been reading about No-Knead Bread and various forms of easy-bake breads. But, the specific type of bread I'm yearning for is a baguette style with a crispy crust and an airy, lofty crumb ("meat" of the bread) with lots of holes. 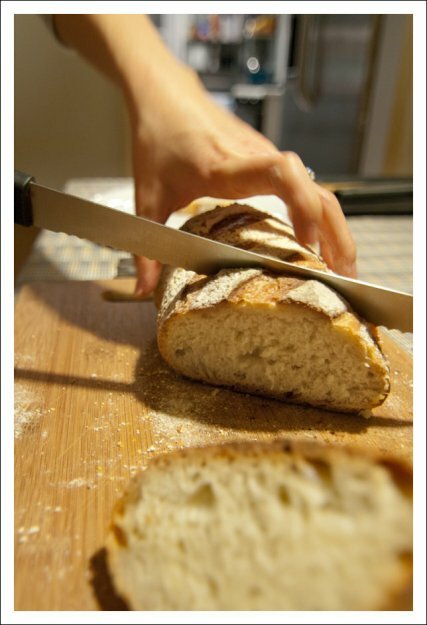 I found a rough recipe on thefreshloaf.com for Anis Bouabsa's baguette. If you haven't heard, he won best baguette in Paris in 2008. It looked like the style I wanted to go for, but I adapted it to use the Dutch oven for the proofing and baking. I also halved and shortened the recipe and made it a fatter loaf to fit the pan. In the end, the bread wasn't as airy as I'd like, and that's probably because I didn't handle it enough during the folding process, or it needs an addition of gluten flour. But I was still very happy with the results. The flavor was great and the crust was so nice and crunchy. The crumb was soft and fluffy. Still very satisfied and will continue to perfect my techniques. It was very easy to make! I used the Staub (4.25qt?) coq au vin cocotte. It was roomy enough for one fattish loaf. If the dough expands too much during fermentation, it might need to be divided and have the rest stored in the fridge for the next day. I'll be updating any changes to the recipe as I continue to improve. This is best prepared after dinner the first evening, and have it ready by dinnertime the next evening. Once yeast is foamy and ready, mix everything together in a large bowl. Knead for a few minutes (in the bowl is okay if large enough) until dough is smooth and elastic. It should be moist but not too sticky. Leave it in the bowl covered with saran wrap. Every 20 minutes for 1 hour (for a total of 3 times), fold and stretch the dough. For folding techniques, check this out. Now you're done for the day! Cover it again and leave it in the fridge for about 21 hours. Take bowl out of the fridge. Line countertop with a large sheet of parchment paper. If the dough is too sticky, sprinkle some corn meal or flour on top of the paper. Take dough out of the bowl and divide into separate pieces if necessary. Drop unused portions back into bowl and into fridge. Gently shape current dough into desired shape with your hands. Avoid pushing air out of the dough or flattening it too much. Lift the parchment paper with the dough and place the whole thing into the Dutch oven. Let the paper hang out the sides of the pot if needed. Put the lid on tightly and let rest for 1 hour. Preheat oven at 450&deg;F. Take dough with parchment back out of the pot, and place the empty pot with lid into the oven. The pot must be heated prior to baking. Preheat for 20 minutes. Sprinkle some flour on top of the dough, and drag a knife across the top to score the dough. The diagonal slashes should parallel each other by about 1/3 of their lengths. Carefully slide out oven rack with the pot and remove the pot lid. Place the dough with parchment back into the pot. Place cover on (don't forget it's still HOT). Remove lid and resume baking for another 10-15 minutes, until the crust is nice and golden brown color. Take pot out of oven and carefully lift the parchment out of the pot and let bread cool on a rack.